I recently made cupcakes for a party and wanted a crowd-pleasing frosting recipe. I knew that Magnolia Bakery would come through for me and they did! I made their Vanilla Buttercream with a twist to make it Vanilla Bean Buttercream. The recipe clarifies that this is not technically a buttercream, but is an old-fashioned confectioner’s sugar and butter frosting. That worked for me, because I was doing a lot of baking and did not want to fuss with a cooked frosting. This frosting was ultra smooth and creamy with a delicious vanilla flavor. Is it sweet? Yes, and that’s a good thing! I substituted vanilla bean paste for vanilla extract. It gives the frosting a little bit of that vanilla bean speckled look, and I think it adds more vanilla flavor. The original recipe calls for an equal amount of vanilla extract. I made this in a stand mixer using the whisk attachment. The original recipe says to use an electric mixer, with no further information about attachments. Covering the mixer with a towel will help prevent an explosion of powdered sugar in your kitchen! Place the butter in the bowl of a stand mixer fitted with the whisk attachment. Add 4 cups confectioner’s sugar and then the milk and vanilla bean paste. Cover the mixer with a clean towel and mix on low until the ingredients are combined. Remove the towel, increase the mixer to medium speed, and beat 3-5 minutes, until smooth and creamy. Add more sugar 1 cup at a time, beating about two minutes after each addition, until the frosting is a good spreading consistency. You may not need to use all 8 cups of sugar. Frosting will set it chilled; use and store at room temperature. 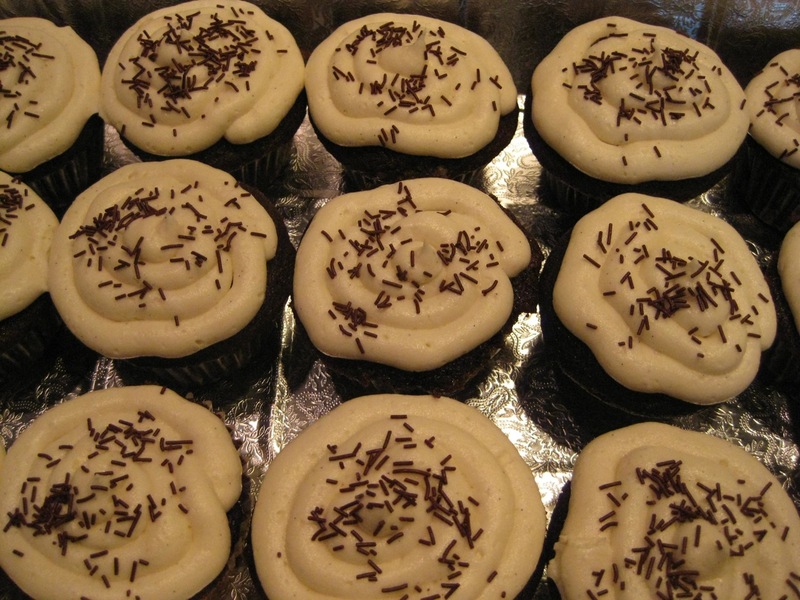 Frosting can be stored in an airtight container for up to 3 days. Magnolia Bakery has several cookbooks, but the one that I used is called The Complete Magnolia Bakery Cookbook: Recipes from the World-Famous Bakery and Allysa Torey’s Home Kitchen. In a serious chocolate mood? Try Magnolia Bakery’s Chocolate Cupcakes and Chocolate Buttercream! I have never used Vanilla Bean Paste–where do you purchase it at? Looks like it is something I need, I do love Vanilla. Your cupcakes look yummy. This frosting is similar to what we always made. Only recently (thanks Dorie) did I learn there were other delightful ways to make frosting. Think Swiss Butter Creme. I’ve learned so much from Ms. Greenspan! Hi Cindy, I ordered the vanilla bean paste from King Arthur. I’m pretty sure you can also get it at Williams Sonoma. I think this type of frosting is classic comfort food! This frosting looks so luscious – wanna sink my teeth into one of those cupcakes. That frosting looks fantastic! This is totally making me want a cupcake right now. Isn’t vanilla bean paste great? I love the extra vanilla flavor it adds. I love that this buttercream recipe doesn’t start with bringing egg whites and granulated sugar up to a certain temperature on the stovetop-those types of buttercreams are WAY too grainy for me. I always love the buttercream recipes that include confectioner’s sugar, which dissolves so easily. Thank you for sharing this recipe-now I need to go and get some vanilla bean paste……:) And by the way, those were some VERY lucky party goers! Those cupcakes look awesome! This sounds like a yummy frosting and using vanilla paste was a great idea. Your cupcakes are adorable! !